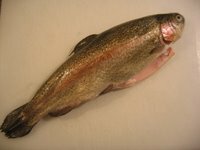 In honour of the wonderful trout dinner I enjoyed last weekend, this week’s Recipe Carousel is going to be all about the Seafood Main Course. Having said “seafood” however, only one recipe uses something other than fish. Sorry for the lack of range, but these are the ones that really caught my eye. 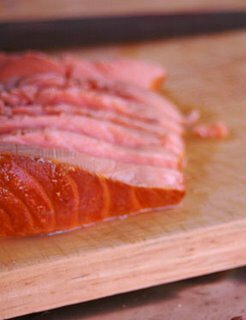 Hot Tea Smoked Salmon. Anthony in Australia (spiceblog) improvised a mixture of rice, sugar and tea then smoked this combination with fish in an outdoor oven. The result was a perfectly robust vermilion-fleshed fish. Photo courtesy of Anthony. 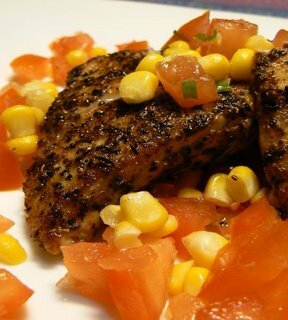 Cajun Blacked Fish w Tomato & Corn Salsa is the contribution from boo_licious in Malaysia (Masak-Masak). Cajun spice seems to be very popular around the blogging world at the moment and boo_licious shows us how to use it well with a tangy tomato and corn salsa flavoured with lime and coriander. The recipe comes from an Australian Women’s Weekly, which just goes to show how the world really is one big recipe carousel. Photo courtesy of boo_licious. Piri-Piri Spiked Snapper in Tomatoes & Spring Onions. Mae from the Channel Islands (Rice and Noodles) has been featuring quite a lot on Recipe Carousel, but when you see her exquisite presentation and the way she turns complicated creations into simplistic dreams you can understand why I keep on coming back to her. 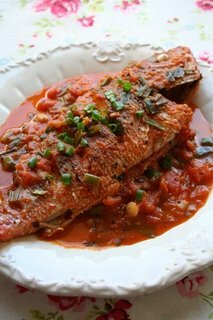 This recipe is Mae’s take on the Philippino dish sarsiyadong isda, fish cooked in a spicy tomato sauce. Photo courtesy of Mae. 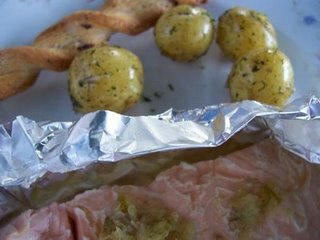 Salmon w New Potatoes. This entry is from Vintage Wine in Sweden (Vintage Wine Design). It’s amazingly simple but that’s why I love it. I’ve only been to Sweden once but having a Swedish partner means I get a good sense of the country. This dish, served with the quintessential new potatoes and dill, seems like a perfect Swedish summer meal to me. Vintage Wine adds a contemporary twist with a lime and ginger butter for the fish. Photo courtesy of Vintage Wine. 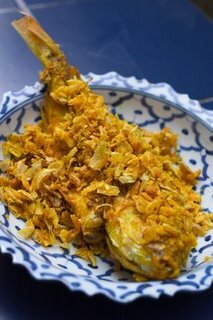 Whole Fish Fried in Tumeric. Austin in Thailand (Real Thai) blogged this recipe for plaa thot khamin, including step by step photos. Garlic, flour and tumeric are pounded in a mortar and pestle and coat the fish. Any remaining mix is deep fried to provide a crispy garnish. This post also comes with a bonus recipe for mullet in tumeric broth. Enjoy. Photo courtesy of Austin. Stuffed Calamari was on the Christmas table of Mia in Germany (Nosh). 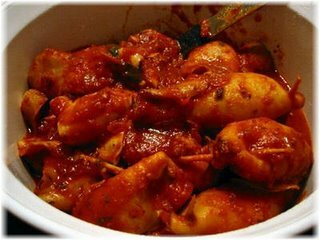 Calamari tubes were filled with breadcrumbs flavoured with garlic, lemon and herbs and then they were cooked in a tomato based sauce and served with pasta. This post also comes with a few bonus recipes such as fried cardunes, flounder with fresh oregano and a shrimp cocktail. Photo courtesy of Mia. 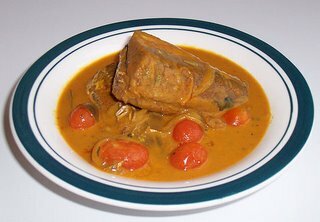 Coconut Fish Curry is the final recipe for this week and it comes from Meena in Canada (Hooked on Heat). Meena’s eclectic cultural background – Malay mummy, Indian daddy, Middle Eastern upbringing – has led to some of the most wonderful creations on her blog. This recipe uses coconut milk, cherry tomatoes, fenugreek seeds and chilli to produce a quick and delicious looking curry. Photo courtesy of Meena. If you want to contribute your own seafood experience and share the love around, just leave the link to your recipe in the comments section. It doesn't need to be your invention – just make a meal and post it on your site. The whole idea of Recipe Carousel is that good recipes are shared with people who love to cook. Note: any spam or non-seafood recipe links will be deleted. Previous Recipe Carousel themes include: drinks, chocolate, soup and ice cream. Well, technically the fish didn't come from my garden, but since there were fresh food markets in the square under my apartment block it kind of counts. Last Sunday I was scanning the available selections when I spotted the Cowra Smokehouse selling various smoked delicacies such as eel, walnuts, quail, salmon and even fresh line-caught rainbow trout. I was irresistibly drawn to the portable glass trolley filled with ice and fresh fish and after much encouragement from Jonas I decided to buy one. I’m glad I did because it turned out to be one of the best meals I’ve ever eaten at home. 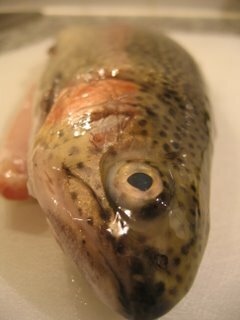 When I got back to the apartment, I stared at the fat trout and thought it was just too pretty to eat. Then I got over that. I decided I wanted to cook it with as little embellishment as possible. It was so fresh that I thought simple was best. Leafing through Rick Stein’s My Favourite Seafood Recipes, I found a few trout recipes but none stood out to me as a whole. Instead I took his cooking technique from one recipe and combined it with a fresh herb sauce from another recipe. Rick says he found the recipe for this herb sauce in an old recipe book from 1820 and it was entitled “housekeeper’s recipe”. If I’d had a housekeeper that had made this for me, I would have been a happy little vegemite. Anna’s muddling of Rick Stein’s recipes. Serves 1 hungry girl. 1. 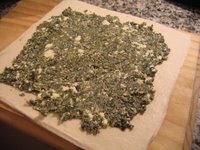 For the salsa verde, combine all ingredients on a chopping board and chop finely until a paste is formed. Scrape into a bowl and add Dijon mustard and lemon juice. Stir to combine then set aside. 2. Heat the butter and oil in a frying pan large enough to hold the fish. 3. Season the fish, inside and out, with salt and pepper. Dust lightly in flour, shaking off excess flour. 4. Fry fish for 5 minutes on each side. 5. 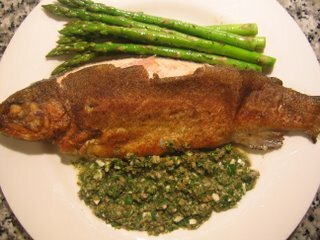 Arrange fish on plate and serve with salsa verde. I simply adored this salsa verde and will use it again and again with anything I possibly can. This whole meal was incredible and I was a very content diner afterwards. I made the salsa verde while Jonas fried the fish. For some reason I hate to fry fish and chicken because I never seem to cook them right. It either comes out dry or raw. Despite being a vegetarian, Jonas is a frying fiend so I left this task to the household expert. It was perfect. 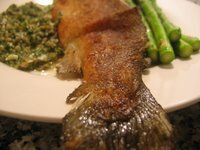 So Pan-fried Rainbow Trout w Salsa Verde is my contribution to Weekend Herb Blogging, hosted by its creator, Kalyn from Kalyn’s Kitchen. Check out the recap if you get the chance. The pool of entries is growing by the week! A breakfast with Moscato d’Asti is a glorious, glorious thing. Last weekend my sister, Jo (aka Shamu), was visiting Sydney with her boyfriend, Tom. She flew in Friday night so that we could spend Saturday morning catching up over breakfast before her whirlwind day of visiting friends and family. I decided to make something special that we could all enjoy and, given that I was going out to dinner the night beforehand, something that could be cooked in advance. I decided on baked eggs & beans, then pears poached in passionfruit juice accompanied by numerous glasses of Moscato d’Asti. I have to admit that this particular version of this recipe is mine, but the idea is certainly not. Back in summer an old friend of mine, Library Spice, invited Jonas and I over for breakfast to meet her man. They cooked us a meal that we have since repeated over and over again. 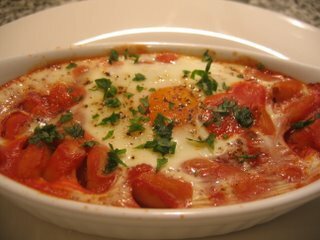 A huge baking dish of beans was topped with eggs and then the whole pot was put into the oven until the eggs set. Brilliant! Even though we got sunburnt in the park when he kicked our butts at Scrabble (forcing us to accept rime, as in the Rime of the Ancient Mariner, over a triple word score), how could we not love the new man when he cooked us this? I replicated my own version, which I suspect it’s identical to his. Anna’s take on Craig’s recipe. Serves 4. 2. Heat olive oil. Sauté onion, garlic and chilli until onion is soft. 3. Add passata. Season with salt and pepper. Stir then cover and simmer for 5 – 10 minutes. 4. Add beans. Stir and simmer for another 5 – 10 minutes. 5. 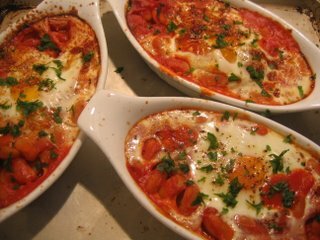 Spoon into four individual baking dishes or one large dish. 6. Make four wells in the beans, being careful to keep a layer on the base of the dish, then crack an egg into each well. Season with salt and pepper. 7. Bake in oven until set. Can take anything from 15 – 30 minutes. 8. Season with salt and pepper then sprinkle with chopped parsley. Serve hot. 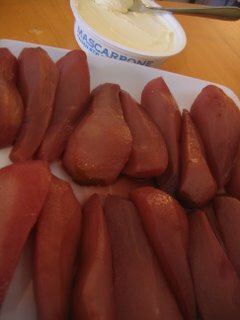 Next we had pears which I had poached in passionfruit juice (it usually comes with a percentage of apple juice and has no seeds). I was trying to find a light yet sweet dish that would compliment the light floral tones of the Moscato d’Asti and I thought passionfruit would be nice. I served it with my favourite yoghurt of all time, King Island Dairy’s Cinnamon and Honey Yoghurt. It’s effectively the same recipe as my pears in spiced red wine. 1. Put juice and sugar into a large saucepan and dissolve sugar over medium heat, constantly stirring. 2. Simmer for 10 minutes, covered, until a syrupy consistency forms. 3. 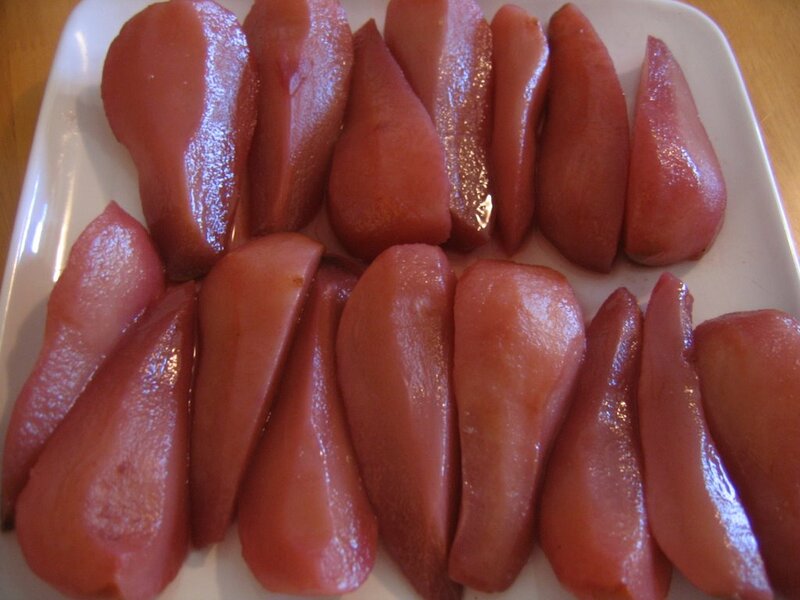 Add pears and simmer for 5-10 minutes or until pears are firm but soft to cut. Be careful not to cook too long or they will disintegrate. 4. 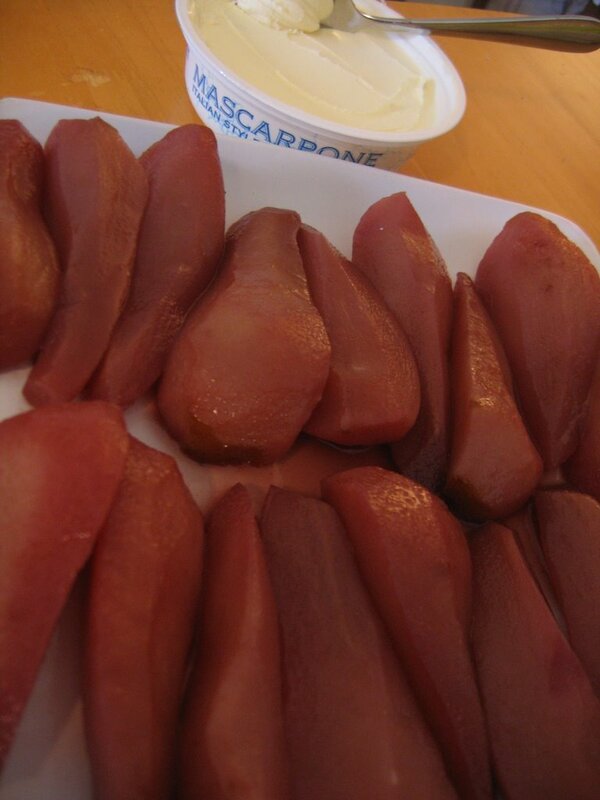 Remove pears and continue to reduce syrup to thicker consistency, approx. 5-10 minutes. 6. Serve warmed with yoghurt and drizzle with passionfruit syrup. This dish worked wonderfully with the Tosti Moscato d’Asti (photo from their website). Made from Moscato grapes, this Italian wine is considered a ‘frizzante’ dessert wine, although it’s very light (not at all sticky) and has fragrant floral aroma of fresh grapes. 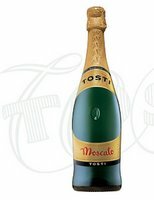 It’s said that the moscato grape was mentioned in records of the region in the 13th century and now Asti is a DOCG (Denominazione di Origine Controllata e Garantita), which means the region is classified with specific winemaking techniques, grape varietals and an international reputation. Asti, in Piemonte, turns the wonderful Moscato grapes into this gorgeous wine with a light spritz, subtle sweet flavour and wonderful floral fragrance. I can’t recommend this wine enough, as either a light summer aperitif or a dessert wine accompanying anything elegant or fruity. Champagne breakfasts are good, but those enjoyed with Moscato d’Asti are even better. This is my entry into Saffron Trail's Weekend Breakfast Blogging, an event in its second episode. Check out Nandita's round-up here for a wide range of breakfasts from around the world and a lot of great Indian goodies. In 2002, I was brought to this diner style laksa house by two Malaysian friends who were missing home cooked meals. It doesn't look nice, the service is pushy but the food is good. It's a home away from home for many Malays and a great lunch venue for those of us working in the city. Jimmy's is where I first discovered assam laksa – a wonderful sour soup flavoured with mackerel and tamarind. 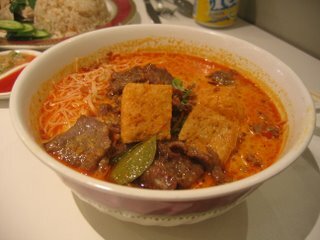 Unlike most laksas, and to my delight, there was no coconut milk and so the broth was clear and fragrant. Filled out with rice noodles, the surface of the soup floats with fish pieces, cucumber, pineapple, red onion and half a boiled egg. 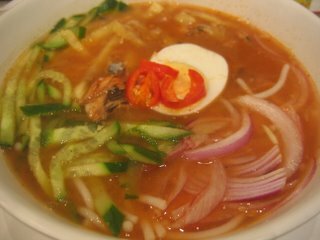 I adore this light broth and devour the noodles with chopsticks smothered in sambal oelek. I also enjoy their nasi lemak, a plate of rice cooked in coconut milk and served on a tray with little individual compartments for achar (pickled vegetable chutney), ikan bilis sambal (chilli and dried anchovy sauce), fried peanuts, a boiled egg, fresh cucumber and curry (usually Rendang). Another reliable dish from Jimmy's is the Hainanese Chicken Rice. Glistening rice that has been cooked in chicken stock is served with your choice of drumstick or breast, accompanied by a light chicken broth with herbs. A brilliant red chilli sauce and murky, yet delicious, ginger sauce complete the meal. Roti Canai is the favourite of one pal who orders two flat roti and a small bowl of curry for dipping: chicken or lamb. Other friends prefer Har Mee (prawn noodle soup) or the Beef Laksa, usually on special. Maybe I am completely behind the times, but I just discovered a great site called Candy Blog and – yes, you guessed it – it's all about candy. Candy is a very American word, but I must admit that it's a word I use all the time. Sorry, but it can't be helped when I have an American father and a Swedish fiancé. Swedes call them godis (goodies), Aussies call them lollies, Brits call them sweets, but in the USA it's candy, candy, candy. Candy Blog is a great database of wonderful sugar based goodies from around the globe, written up and reviewed by Cybele. I am impressed with the range of candy flavours she tries and love the great table rating system she has developed. The whole layout of this blog is brilliant, easy to read and visually appealing. You get the sense that this is the place to come to investigate sugar produce. I am also pleased to see a lot of candy and chocolates from around the world as well. Although there are a lot of American features, she’s pretty even handed considering the US produces so much of the world’s candy. With the range of information available on this site, I am completely inspired to go out there and try more candy myself (oh, great - more things for me to eat when I'm supposed to be on a wedding diet). There are other blogs out there that focus completely on candy as well as and non-food related blogs that record the obscure confectionary that exists. Take for instance Floating World Views: Suzy, an Australian living in Japan, can’t help but notice the weird and wacky Kit Kat flavours that appear regularly in Japan (wine, cherry blossom, fruit parfait, green tea etc). Anyway, Cybele's blog has really excited and invigorated me. It's just so interesting to read. Yes, I am truly a blogging nerd. Since so many of my fellow bloggers live in the northern hemisphere and are experiencing an amazingly hot summer, I thought this week’s Recipe Carousel should be about ice cream! There are some brilliant ice cream recipes out there, but I scoured the blogosphere and pulled out seven of my favourites for you. Seven chilly treats for seven steamy northern hemisphere days. 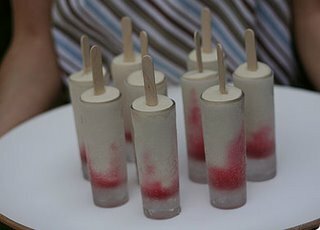 Strawberry, Rhubarb & Almond Ice Lollies. 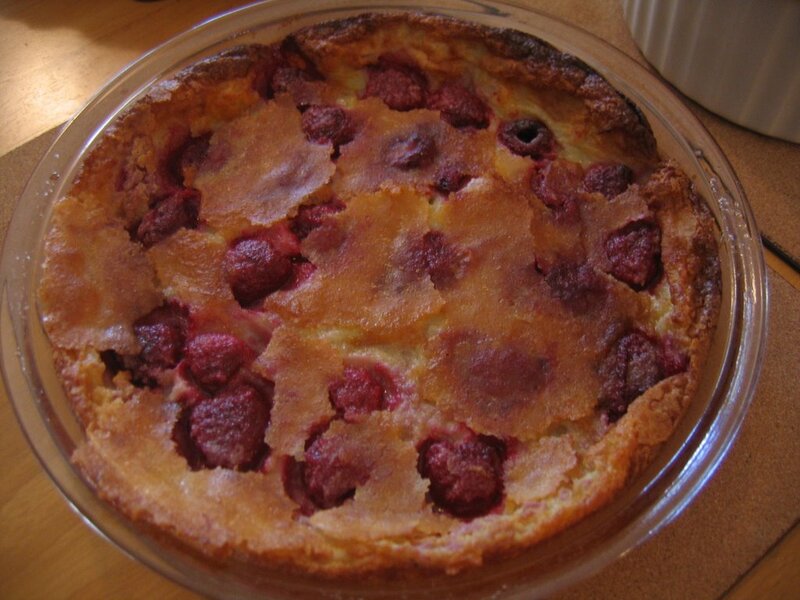 Keiko in the UK (Nordljus) has produced another elegant dessert from her amazing repertoire. On this occasion individual shot glasses are filled with layers of stewed fruit and yoghurt based ice cream. Yum! Photo courtesy of Keiko. Caramelised Oatmeal Ice Cream. Santos in Guam (The Scent of Green Bananas) shows her soft spot for Scottish fare with this modern take on the traditional Scottish dessert cranachan. 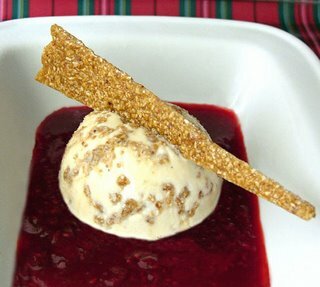 Vanilla ice cream is mixed with caramelised oatmeal and whisky, then served with a raspberry sauce. Photo courtesy of Santos. 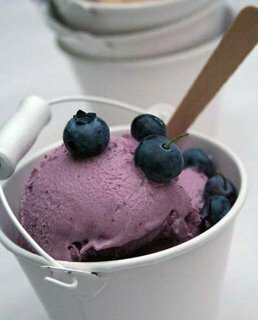 Blueberry Ice Cream. 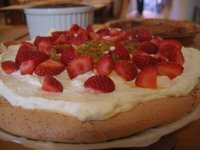 This classic berry is turned into a divine frozen cream by Mae in the Channel Island of Jersey (Rice and Noodles). Mae’s summer addiction to blueberries and the arrival of an ice cream machine meant we all can revel in this gorgeous creation. Photo courtesy of Mae. Singapore Ice Cream. Flavoured with chilli, black peppercorns, candied ginger and pistachio, I am totally entranced by this delicious sounding, spicy ice cream. Tea in the USA (Tea and Cookies) devised her own version of tis exotic, delightful ice cream created by Alice B. Toklas. Ms Toklas wrote a cookbook in 1954, describing meals she shared with her pals, such as Picasso and Hemingway, during her life in Spain, France and the US. Photo courtesy of Tea. Guinness Ice Cream. Using this indigenous Irish brew, Kieran in Ireland (Ice Cream Ireland) came up with this great recipe which combines Guinness, cream and choc chips. This ice cream might sound strange but it's a successful flavour for sale at Kieran’s own ice cream shops, Murphy’s, in Dingle and Killarney (Kerry, Ireland). Photo courtesy of Kieran. Green Apple Sorbet. This verdant ice comes from Béa in the USA (La Tartine Gourmande). 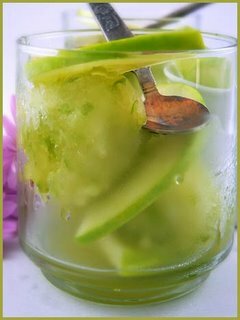 It is a simple recipe using Granny Smiths, lemon juice and sugar syrup and it keeps Béa cool during summers without air conditioning. Photo courtesy of Béa. 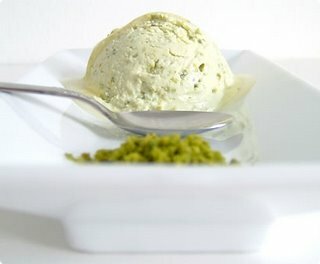 Honey Yoghurt & Pistachio Ice Cream. Nicky & Oliver in Germany (Delicious Days) came up with this great ice cream based on breakfast ingredients. 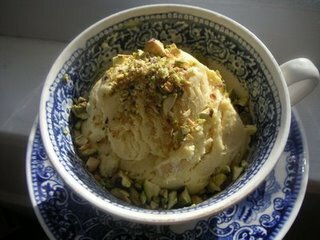 Honey adds an extra sweetness to tangy Greek yoghurt and the pistachio nuts seem to add texture. Drizzle with extra honey (or if you’re like Oliver – extra, extra honey). Photo courtesy of Nicki & Oliver. That’s all seven recipes for the week, but if you’re on an ice cream kick I suggest you check out a once off blogging event that was hosted by Sam at sweet pleasure : plaisir sucré where bloggers from around the globe contributed an array ice cream recipes. Flavours included: buttered pecan; butternut squash; Chambord (black raspberry liqueur); cherry blossom; chestnut; chocolate; coconut matcha; Dom Perignon; edamame (soy beans); elderflower; gianduia (choc-hazelnut); gooseberry & elderflower; lemon; Limoncello; mango; mojito; orange & honey caramel; pear; pistachio; prune frozen yoghurt; red finger millet (ragi); roasted cinnamon; strawberry; strawberry crème fraîche; Thai ice tea; three berry custard; vodka watermelon; and white peach!!! If you want to catch any of my previous Recipe Carousels, here are links to posts on drinks, chocolate and soups. 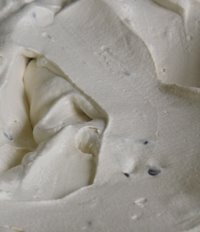 If you want to link in your own ice cream recipe and share the love around, just leave the link in the comments section. You didn’t have to invent the recipe yourself, just make it and post it on your site. The whole idea of Recipe Carousel is that good recipes are shared with people who love to cook. Note: any spam or non-ice cream recipe links will be deleted. 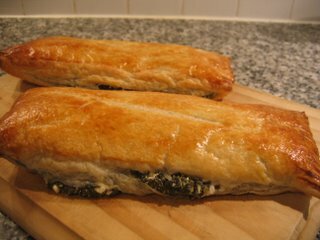 One day I was planning to make my mum's recipe for spanakopita (the Greek spinach and feta pie) but our green grocer was out of spinach. I decided to try the deep, dark green leaves of the silverbeet instead. I was in heaven!!! Silverbeet, also known as Swiss chard, has the same common ancestor as beetroot and sugar beets. It’s flavour is slightly bitter and also slightly salty, but very delicious. The pretty leaves are such a beautiful green and wrinkled, like a Savoy cabbage. The stalks are thick and white, but some kinds of chards can have red stalks too. Various health studies claim silverbeet can provide the vitamins and minerals that help prevent cataracts, digestive cancers, skin cancers, bone decay, high blood pressure, migraine headaches and muscle spasms (including cramps, tension, soreness, fatigue and even heart muscle spasms and asthma). And I just love the flavour of silverbeet. It’s full of iron goodness and provides a nice kick to the tangy lemon and strong fetta in this pie. 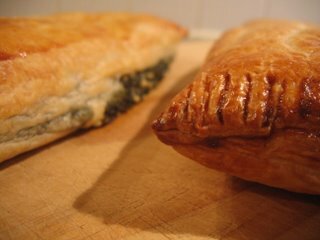 We switched to using puff pastry for this no fuss, (fairly) healthy and delicious dinner. Leftovers are eaten for lunch the next day. Anna & Jonas' very own recipe. Serves 4.
a) use the microwave – put a little water and some silverbeet in a microwave dish and microwave until wilted. b) use the stove – put a metal colander on top of a pot with a little boiling water. Place batches of silverbeet in colander and cover with pot lid. Steam until wilted. 3. Squeeze excess liquid from silverbeet and chop finely. 4. Begin thawing puff pastry. 5. In a bowl, mash together with fork the feta, lemon juice, pepper and silverbeet until combined and smooth. 6. Divide mixture in two, spread evenly over pastry sheets leaving 2cm border. 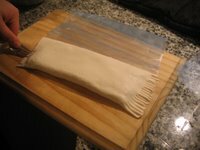 Fold pastry into log shape, sealing edges together. 7. Beat egg in bowl with milk. Brush pastry with egg wash. Sprinkle with sesame seeds. 8. Line baking tray with baking paper. Place rolls on tray. Bake in over until pastry puffs and turns golden, about 15 – 20 minutes. Check out the recap of all the other Weekend Herb Blogging from around the world. This week it's hosted by Paz from The Cooking Adventures of Chef Paz. Slinky Minx, creator of the birthday cake extraordinaire, has other secret talents. She is also the Platoon Commander of the Wine Angels, a brigade of alternating winos that sip and slurp their way through blind tastings. Two weekends ago, the Platoon Commander invited me to her latest tasting: Dessert Wine High Tea. Each of the eight invitees were charged with bringing a dish that could be served at a High Tea and we ended up with homemade aioli and freshly blanched vegetables, dainty sandwiches including curried egg and smoked salmon, a platter of wonderful Italian cheeses, tiny warm quiches, strawberry pavlova, sticky date pudding with butterscotch sauce, raspberry clafoutis and my own pears poached in spiced red wine. But we were there for the wines! Six glasses were laid down before each of us and six different wines were poured in a precise order, each bottle disguised with brown paper. We were given paper and a pen and asked to take notes on the bouquets and flavours of each one. Then we were asked to rate the wines from our most favourite to our least favourite. After our first tipple, we snacked on our high tea treats and chatted amongst ourselves before returning to the wines to try them again. 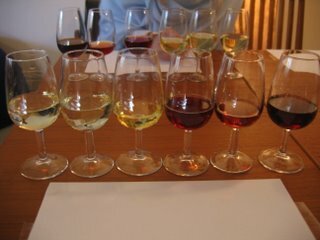 After eating the food, we tried to locate new flavours and scents from the wine and gave our final ratings. Two of the wines were Italian and the rest were Australian. 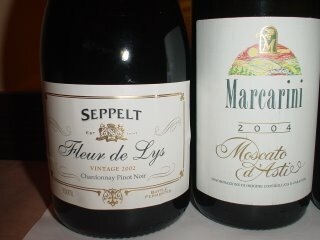 We were asked to guess which was which and also to guess the wine styles or designations. 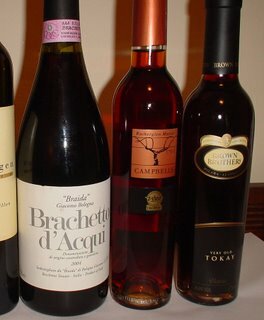 Since I had donated one of my highly prized bottles of Braida Brachetto d'Acqui, I already knew one of the Italian wines. 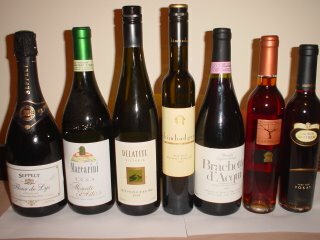 For me the tasting was really about guessing the remaining five wines and enjoying a glass of the Brachetto d'Acqui. Here are the wines we drank and included are an odd assortment of comments about each wine that came from the group as a whole. So, I bet you’re wondering how I went on the wine guessing? I was pleasantly surprised with myself because I guessed four from the remaining five wines. I recognised the moscato d’asti, the late pickled Riesling, the botrytis Semillon and the muscat. Only the tokay slipped from my grasp when I thought it was a Pedro Ximenez sherry! For those who know wine, apparently they are nothing alike. Oopps! I was proud that I could recognise so many, but then I have to admit that I am a dessert wine fanatic and if I had been facing any other kinds of wines I would have failed miserably whereas other tasters in the group would have soared. I was really pleased that everyone enjoyed the Braida Brachetto d’Acqui. I've waxed lyrical about Braida before and when I discovered their brachetto I was so happy and thrilled because it’s not only delicious but it’s something unique to what most Australians drink with dessert. I was glad I could share this with others. As for the poor Late Picked Riesling, we all agreed it was really drowned out by the other wines. 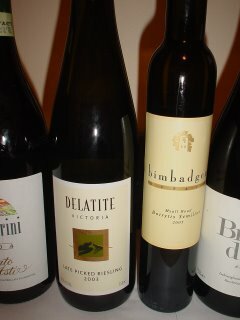 They were heady and overpowering, whereas the Riesling was subtle and not as sweet. I think I would have enjoyed this wine immensely in another setting, perhaps in a Riesling tasting (hint, hint to the Platoon Commander for the next wine night). Slinky Minx has been very serious about her Wine Angels nights and has already hosted quite a few such as Burgundy; Rhone; Cabernet; Syrah/Shiraz; Big Reds; Asian cuisine and white wines. Soon she’ll have a dedicated website and a registered business. Best of luck! For the Wine Angels Dessert Wine High Tea I made some pears poached in spiced red wine, a recipe I love using for all kinds of fruit. 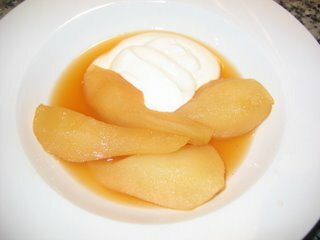 I use the same poaching liquid to soften quinces, apples and even plump up dried fruit like figs, apricots and raisins. The results are extremely rich and should be accompanied by ice cream, yoghurt, cream or mascarpone and a drizzle of the syrup. 1. Put wine, orange juice, sugar, rind and spices into a large saucepan and dissolve sugar over medium heat, constantly stirring. 5. Serve with thickened cream, mascarpone, yoghurt or ice cream and drizzle with red wine syrup. It’s also good to note that this poaching syrup is also my own version of glögg, Swedish mulled wine which is more commonly known by its German name glühwein. Anna's very own recipe. Makes 5 x 200ml drinks. 2. Into heatproof glasses drop a couple of raisins. 3. Strain wine into glasses and serve hot (with some ginger biscuits). This past week in Sydney has been quite cold and therefore the theme for this week’s Recipe Carousel is soup. I love soup. I simply cannot get enough of the stuff because it’s usually so filling and warming yet provides me with much needed hydration since I don’t drink any water. Yes, yes I know I’m naughty but there’s nothing worse than a stomach full of sloshing water. 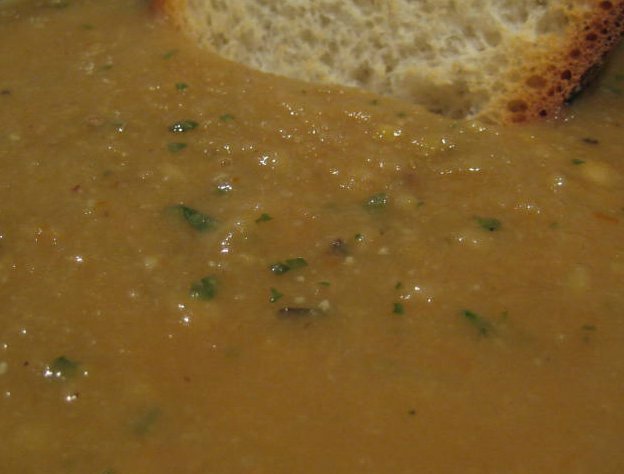 Chestnut & Lentil Soup comes from Emma in New Zealand (The Laughing Gastronome). Having seen chestnuts for sale in my green grocer I’ve often wondered what to do with them. 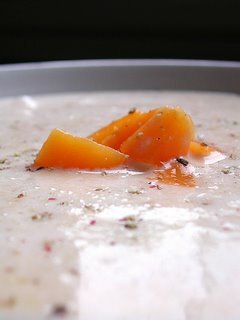 Emma provides an excellent idea with this rich soup flavoured with fresh herbs. Photo courtesy of Emma. 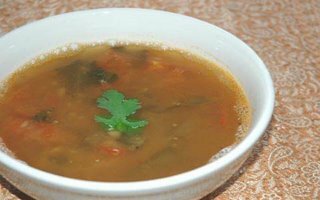 Rasam is a tamarind flavoured soup from Priya in the USA (Sugar and Spice). This broth uses a lot of spices and herbs to flavour it and from the list of ingredients I imagine it would be a delicious sour and spicy treat. Photo courtesy of Priya. 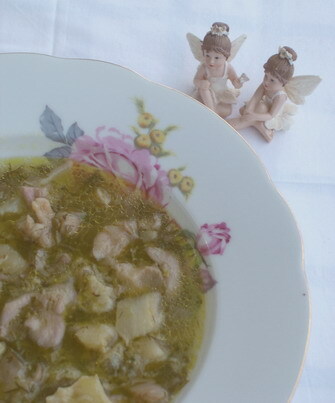 Magiritsa with Oyster Mushrooms is Stevi in Greece’s (Bread and Butter) vegan version of a traditional Greek lamb soup served at Easter. It looks rich and meaty even though it’s completely animal free. It’s flavoured with some of my favourite things – lemon, artichokes, herbs and mushrooms – so I’m keen to try this one. Photo courtesy of Stevi. 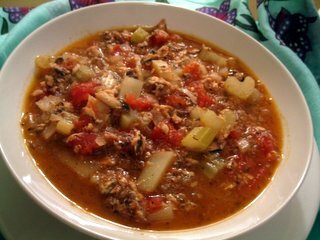 Balik Corbasi or fish stew has been posted by Binnur in Canada (Binnur’s Turkish Cookbook). This rich broth is chunky with potatoes, tomatoes and Binnur’s choice of fish, smelt. 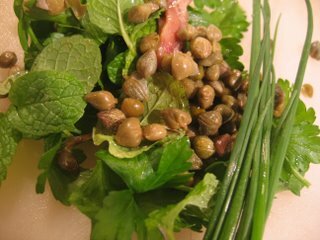 Top with fresh herbs and eat with crusty bread. Photo courtesy of Binnur. Hot & Sour Soup is the offering from Stephen in Taiwan (Eating China). Also known as Suan La Tang, this soup is very strong flavoured and hearty but uses some potentially frightening ingredients such as congealed pig’s blood. Don’t let that put you off – chances are you’ve already eaten this many times in Chinese cooking without even knowing it. Photo courtesy of Stephen. 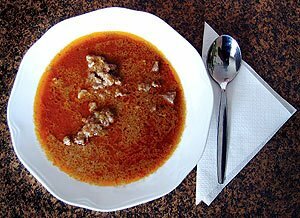 Gulaš (or goulash) is a famous stew/soup with origins in Central Europe. This recipe was written up by Rachel in Slovakia (Slovak Spectator) which is a newspaper and not a blog. Yes, I’m cheating on my own blogging event here but I love gulaš and so I wanted to share this recipe with you. This particular recipe comes from eastern Slovakia and via a man named Miroslav Karpaty, whose surname relates to the Carpathian Mountains where my own paternal family hails from. Photo courtesy of the Slovak Spectator. Chilled Peach Soup is the final recipe for the week and is a unique and summery take on the soup theme from Christiane in the USA (28 Cooks). She uses fruit juices, peaches, yoghurt, white wine and cracked pepper to create what she would rate as one of her top five recipes of all time. Sounds good, looks good and therefore likely to taste very good. Photo courtesy of Christiane. That’s it from Recipe Carousel for another week. If you want to link in your own soup recipe and share the love around, just leave the link in the comments section. You didn’t have to invent the recipe yourself, just make it and post it on your site. The whole idea of Recipe Carousel is that good recipes are shared with people who love to cook. Note: any spam or non-soup recipe links will be deleted. This is my entry for Mixology Monday with the theme being lemon. Jiggle The Handle is the host so visit the recap to find out what other lemon cocktails were produced for this blogging event. 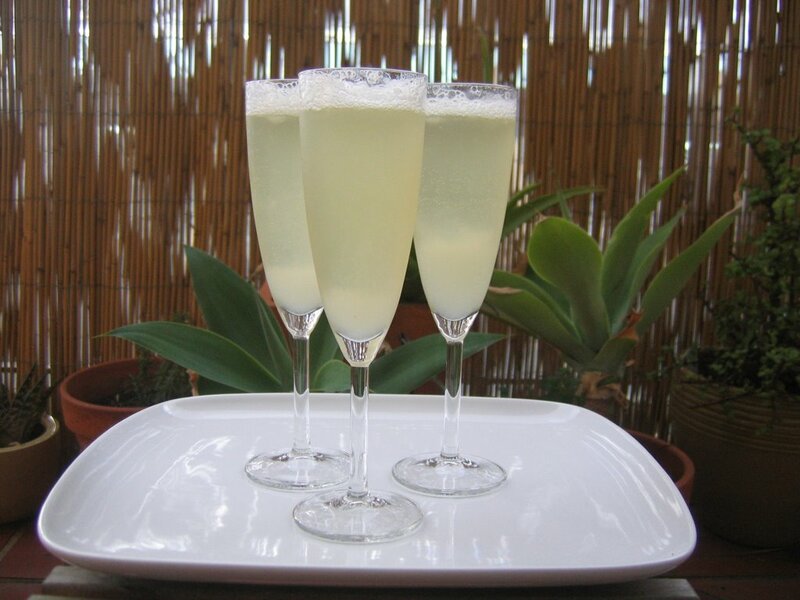 My entry is the sgroppino, a classic beverage from the Veneto region in northern Italy that uses lemon gelato, prosecco and vodka. I first drank this yummy cocktail on Capodanno 1998-1999 (New Years Eve). I was staying with family friends in Vittorio Veneto and, after a homemade dinner of wild boar and grilled radicchio, I was served a sgroppino as a digestive. In Veneto they use vodka as the spirit of choice, but you could you grappa or limoncello if you prefer. Italian lemon gelato is more like a sorbet and doesn’t include any milk/cream based products. I’ve noticed some American recipes call for cream and/or ice cream. I suppose you could add dairy, but why mess with a good thing? The drink consistency should be a little runnier than a slushie and is the perfect pre or post dinner cocktail. 1. Chill 4 champagne flutes. 2. Shake gelato, limoncello and vodka in a shaker. 3. Add Prosecco and whisk through. 4. Serve immediately in chilled champagne flutes. Sprinkle lemon zest on top. Unfortunately the one I made for this photo didn’t turn out quite right. I didn’t have enough gelato for the portions so it was lemony, but not the slushie like consistency it should have been. Don’t let this photo fool you. A good sgroppino is an adult lemon slushie and your own little ticket to heaven no matter whether it’s sunshine or snow!